Make sure a birthday is filled with laughs! Squirrels eating frosted cupcakes bring a smile to everyone's face and who can resist adorable animals in hats? 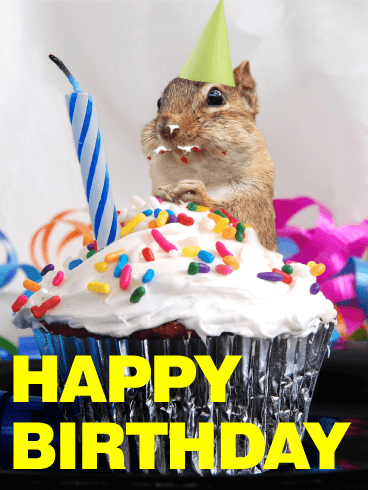 With his puffy cheeks and frosting coated lips, this critter is bound to be the center of attention and the best birthday card they get all day. Start their day right with a birthday card that promises to be a good party. Send an explosion of joy! 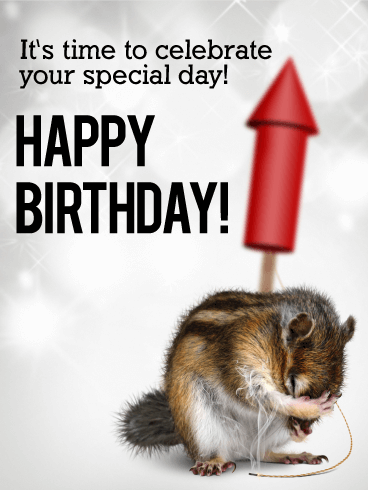 This chipmunk has lit the fuse and started a day that's going to rocket to the highest heights. Soaring up to the clouds and exploding in a burst of fun, this birthday card promises that this year will be the most spectacular yet. Prepare for an amazing celebration, because this card will inspire the birthday boy to have the best day possible! 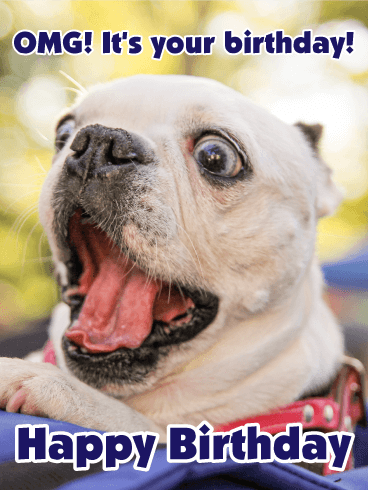 This crazy-eyed dog is super excited to celebrate a birthday! (He's also super cute!) 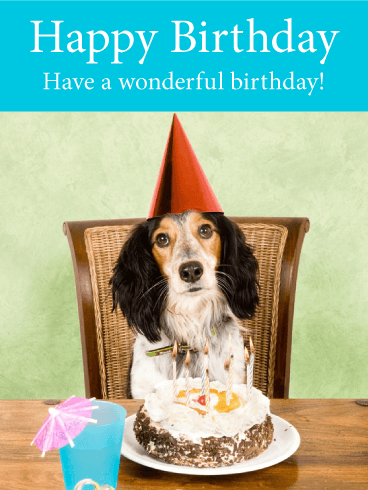 Say "Bow-Wow WOW" to someone awesome in your life with this funny birthday card. OMG, and don't BRB, send it now so they can ROFL ASAP. Bring some kitty cuteness to the party and make someone's birthday a special one! 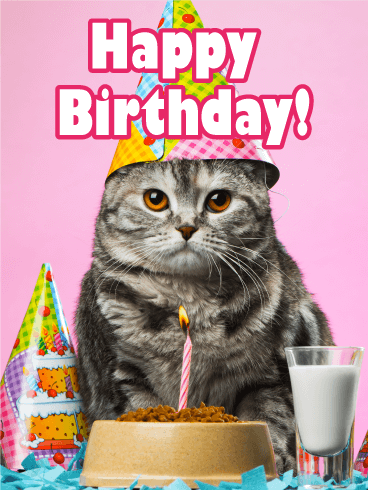 This colorful birthday card where the cat is ready to party is the best you can offer to the birthday friends! Offer this birthday card to your favorite party people today! 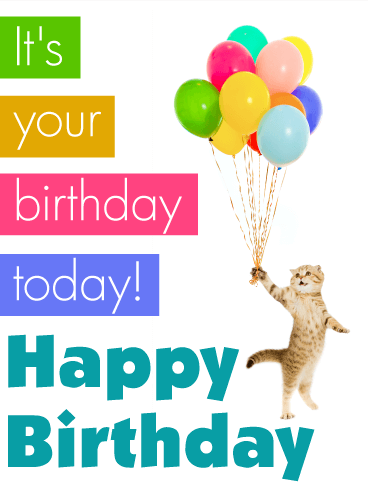 This colorful birthday card will make your friend, sister or cousin purr with happiness! An excited cat bringing balloons to the party and adding some color to their special day - what's not to love?! Send this birthday card today to your dear one and make their day even more colorful! Make your friend smile on their birthday with this cute birthday card! This gorgeous gift box with a precious kitty coming out of it is the perfect card for their birthday. They'll keep it close to enjoy for days to come. 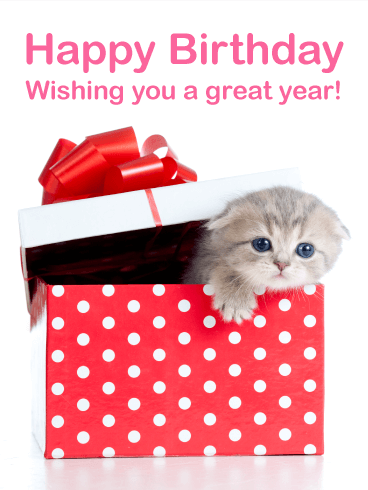 Get this adorable kitten birthday card for a dear friend today! This heartwarming birthday card will make the birthday friends want to smooch it! Make their special day even better and offer them this colorful birthday card. The dogs are ready to party, the candles are ready to be blown - your friend needs to have this card! Don't make them wait! The perfect birthday card to sweeten up your friends or family members! 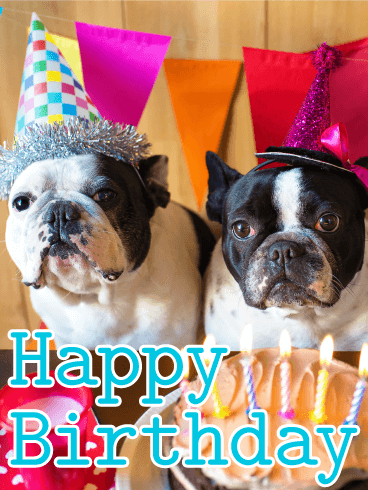 The puppy's tender eyes and party attire will warm their heart and they'll be ready to blow out the candles on their cake too! 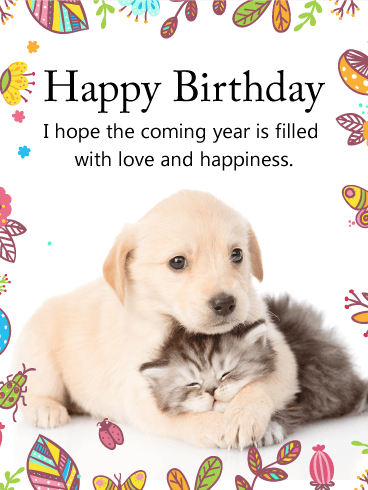 Send them this cute birthday card today and they'll be happy the whole year! This cheerful birthday card is perfect for your party-loving friend. 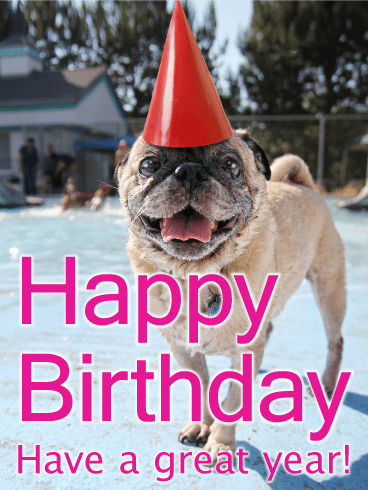 The adorable pug put on its best celebration hat and can't wait for some treats for making the appearance at the birthday bash! Make someone's special day even happier with this festive birthday card! A tender birthday card for a tender soul. It's perfect for that special someone you love to hug or that younger sister you used to squeeze lovingly. Make it a memorable moment and offer them this pair of cuddling puppy and kitty. Beware! Cuteness overload! 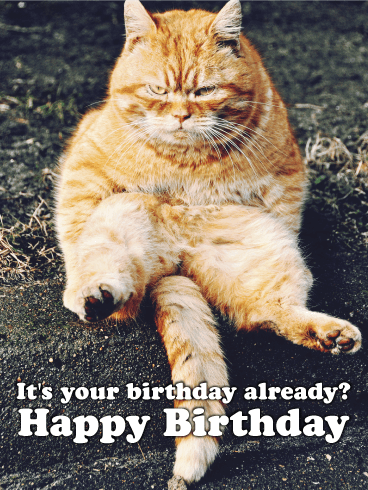 A funny birthday card for the ones who appreciate grumpy cat's humor! Don't take its face seriously, the cat is ecstatic for the upcoming birthday. Offer this funny birthday card to someone dear, with a sense of humor, and they'll love you for it! The party is on! This enthusiastic dog is ready to have a great time with its party attire, balloons and cake! 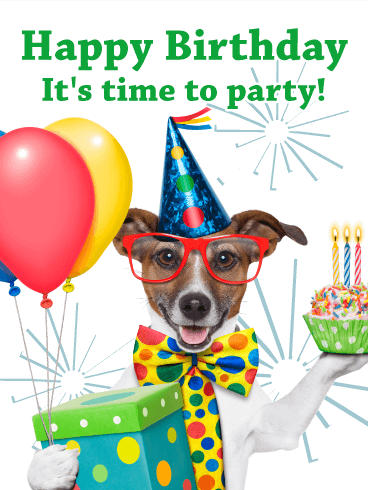 And a great time is what your birthday friend will have when they get this colorful party-dog birthday card. Wait no more, send it to them today!